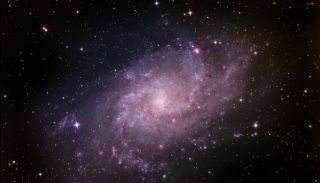 Triangulum Galaxy, also known as M33, is located roughly three million light years from Earth in the constellation Triangulum. Astrophotographer Amir Hossein Abolfath took this photo in Aug. 2012 from his home country of Iran. The Triangulum galaxy shines millions of light-years from Earth in this stunning night sky photo. Astrophotographer Amir Hossein Abolfath took this photo in August 2012 from his home country of Iran. The night sky photographer used a Canon 5D MIINo#2719 camera, GSO 10" Newtonian Astrograph and Wynne 3" Corrector—LVI Autoguider on EQ6—7 x 7min on ISO 1600. The Triangulum galaxy, also known as M33, is about 3 million lights-years away from Earth. A light-year is the distance light travels in one year, about 6 trillion miles (10 trillion kilometers). It’s the third-largest member of the Local group of galaxies, which include our own Milky Way, the Andromeda galaxy and 30 smaller galaxies. These galaxies are all bound together by gravity. Because they are bound together, collisions between the galaxies can occur. However, the Milky Way won’t collide with the Triangulum galaxy anytime soon because it’s so far away. This galaxy is also very different from out Milky Way. It has little or no central bulge of stars, and astronomers figure if it has a central black hole, the mass of it is probably no more than 3,000 times that of our sun.